I recently returned from the First Line Therapy certification workshop in Denver, Co. What an intense and wonderful experience! The training provided by the Metagenics team was impressive. We received training from Lyra Heller, Chris Katke, Dr. Kenneth Browning,DO, Dr. Kristi Hughes,ND, and Michael Alosso. The National Institute of Health Guidelines recommend that prior to the start of a cholesterol reducing drug therapy program, patients be provided with 12 weeks of Therapeutic Lifestyle Change education by the physician, a health coach, a nutritionist, or other lifestyle educator. Unfortunately, this does NOT appear to be the way most physicians follow the guidelines. As I wrote in Why it’s Important to Question Your Doctor, this was certainly NOT how my husband’s endocrinologist handled his case. I worked side by side with doctors on specific case studies. This gave me, as a Health Coach and a Lifestyle Educator, experience with how a doctor approaches a patient in regards to their nutritional needs. I found out that most doctors only have one course on nutrition while in medical school. ONLY ONE COURSE! How are they expected to guide us in our goal of achieving great health? It’s no wonder that most will prescribe medication as opposed to prescribing a therapeutic lifestyle change. I learned the importance of body composition as opposed to weight-loss. Many times I cringe when I see weight loss challenges in corporations, on TV, etc… I have always been concerned with quick weight loss schemes. I, too, have had a life filled with weight challenges. When the person gets off the scale, do they know how much fat they lost? Or how much muscle they lost? Or how much of the weight loss was water? I receive training on an amazing process that focuses on common sense, balance, nutrition, & body composition which is backed up by clinical research and scientific data. Most of all, I received an incredible confirmation that the work I do is IMPORTANT and NECESSARY, if we, as a Nation, are to get back on track with our health. 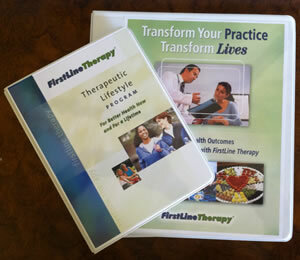 My next step is to pass the First Line Therapy Certification exam with flying colors. Once I have done so, I plan to work in partnership with my client’s physicians, to provide health coaching as a Certified Lifestyle Educator. I focus on NOURISHMENT of body, mind & spirit. I am so EXCITED about my work!!!! I am a Health Coach and a Lifestyle Educator. I am helping to change the world one client at a time!!! Hi Ruthie. Just noticing your blog and wondering if you found a dr to work with utizibf First Line Therapy? I’m taking certification training this month and intend on doing the same. Need to know how to approach the Dr’s. Would live some feedback.